Handyman Works is a family owned business that has been serving the Denver metro area since 1996. The company was formed after realizing the need for quality home repair services done by honest and skilled workers. Our family previously owned a hardware store where customers were constantly asking for help with odd jobs. The stories they told of shoddy work and price gouging were enough to get us out in the community. Since that time, we have built a reputation for excellent service and standing behind our work. We are continually striving to better our home improvement and repair services by listening to our customers and making necessary changes. Each of our skilled craftsmen has extensive experience in the construction field. All have also passed our strict screening and background checks for criminal, driving and drug related charges. And we are all bonded and insured to protect our valued customers. We believe in letting our professionals work on what they are best at. So, all calls go through our office. We coordinate and schedule your job and we keep in contact with you and the craftsmen throughout the project. If you decide to expand your job or make any changes, we handle that too. We ensure your job is started and completed as scheduled. 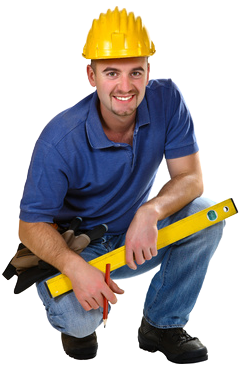 All work is billed through and payable to Handyman Works. Home Improvement repairs have become a multi-billion dollar industry that continues to grow at record rates. With this, the industry has seen a shortage in quality professionals, thus creating an overnight market of non-qualified tradesmen that give the business a bad name. Handyman Works has developed a program that protects our customers by pre-screening all our tradesman to ensure that they are of the highest of quality and reliability. We not only screen our tradesman for your safety, but we go as far as standing behind their work with a 100% satisfaction policy. If for some reason you are not happy with the work, we will make sure the job is completed to your satisfaction. Some people believe a handyman is a ‘Jack of all trades,’ master of none. That’s one definition. Our definition says: One who does odd jobs. That’s even better, because we have done some very odd jobs! There are some people who find themselves unemployed and decide to be a handyman between jobs. Others needing some extra income and decide to moonlight as a handyman. A third type would be the professional. This is an individual who has chosen the vocation of being a handyman. It is similar to someone who becomes a plumber or an electrician. What Makes up this Occupation? We think the first requirement is a natural inclination to understand how things work. Second is common sense. Third is a willingness to study how things operate and how to repair them. Fourth is the acquisition of the tools and supplies necessary to do a wide variety of jobs. Fifth and most important, is knowledge of your limitations. Sixth is hands-on experience. The bathroom remodel work was professional, on time and the job came in under budget, Thanks for all the Hard work. Your company was very attentive to all my needs, both when I called the office, to the handyman you sent out. I was extremely impressed and will call you again.